PARIS, FRANCE (ANS) –Vandals caused serious damage in an attack on a French Church. The church in Angoulême, France, was severely damaged on March 8 by vandals seemingly intent on sabotaging worship services. Barnabas Fund reports the intruders sabotaged the sound system and threw large quantities of paint on walls, chairs, a piano and Bibles at the Hope and Life Church. The cost of repairs is estimated to be €11,000 (£9,400; $12,400). 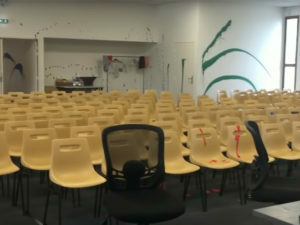 The Hope and Life Church in Angoulême, France, was the most recent target as attacks by vandals on Christian churches in the country spiral upwards. On February 5, a fire was started at the Cathedral of Lavaur and, the following day, excrement was smeared in the shape of a cross on a wall of a church in Nîmes. A church interior in Dijon was defaced on February 9 and a statue of Christ was beheaded at a church in the village Saint-Gilles-Croix-de-Vie on February 23. A church in Houilles was reportedly targeted three times within a week, near the beginning of the year.